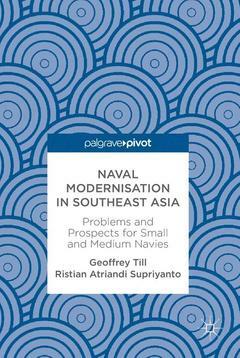 Chapter 1: Growing a Navy, Problems and Prospects: An Introduction (Geoffrey Till).- Chapter 2: The Challenges of military development in Southeast Asia (Bernard Loo).- Chapter 3: A common setting for naval planning in Southeast Asia ? Two case studies in divergence (Collin Koh Swee Lean and Lee YingHui).- Chapter 4: Naval development in Singapore (Collin Koh Swee Lean).- Chapter 5: Naval Development in Indonesia (Ristian Atriandi Supriyanto).- Chapter 6: Naval Development in Malaysia (Geoffrey Till and Tsjeng Zhizhao Henrick).- Chapter 7: Naval Development in Vietnam (Truong-Minh Vu and Nguyen The Phuong.- Chapter 8: Conclusions (Geoffrey Till and Ristian Atriandi Supriyanto). Geoffrey Till is Emeritus Professor of Maritime Studies at King’s College London, UK, and Chairman of the Corbett Centre for Maritime Policy Studies, UK. Since 2009 he has also been a Visiting Professor and Senior Research Fellow at the Rajaratnam School of International Studies, Singapore.